I will never forget the first time I learned that Sifu knew my name. It wasn’t. Not in the slightest. In the years since that night, I came to know Sifu as a teacher, as a guide, and as a friend. If I were to use one word to describe Sifu, it would be generous. One of the most generous human beings I have ever met, in all senses of the word. Generous with his time. Generous with his knowledge. Generous with his assistance. Generous with his patience. And generous with his understanding. He put up with me when I was not at my best, helped me out in numerous ways over the years, explained things over and over, and led trips for us to China. But above all, he loved to teach and was always ready to give willing of his time to share what he knew. Once, on one of those trips to China, while we the tour participants were practicing with the local master I looked over to see Sifu chatting with a stranger. Not five minutes later, the stranger was in a stance and Sifu was proffering explanations and suggestions. He was that eager. Kung fu was his passion in life, and he expressed it fully. Of course, there are many words that can be used to describe Sifu. Rigorous: Sifu never rested on his laurels with “this is how things are, this is what I remember, this is how this art is done,” he was always testing, exploring, relearning, and deepening his understanding of every art he learned. Resourceful: Sifu managed to make a living in the Bay Area through his love of the martial arts, without having to compromise the principles of the art. Renaissance Man: Sifu was skilled way beyond just the martial arts, teaching himself to be a weaponsmith, a tui na and herbalist healer, author, video producer, carpenter, businessman, real estate agent, and father. Peaceful: Sifu lived his life with equanimity and faced things as they were. Devilishly witty: Sifu could break out an astute little twist or cutting yet loving phrase or instruction at unexpected moments. Humble: Sifu didn’t like attention or speeches, he just wanted to practice and grow. Industrious, fastidious, inventive, curious… I could go on. Sifu was a genuine martial artist, interested in the art side of things as much as the martial. He studied diligently and delved deep into the heart of several styles to discover their deepest roots and concepts. He wouldn’t recite answers from memory: ask him a question, and it he would generate it from first principles. Ask him in a year, and his answer may shift as he grew his understanding. He always knew exactly what to give you that would improve your form; never more, never less. And it was all delivered without attitude. He never sought the limelight, he never gated his teachings, he never compared himself to others. He was at where he was at, always walking the path. 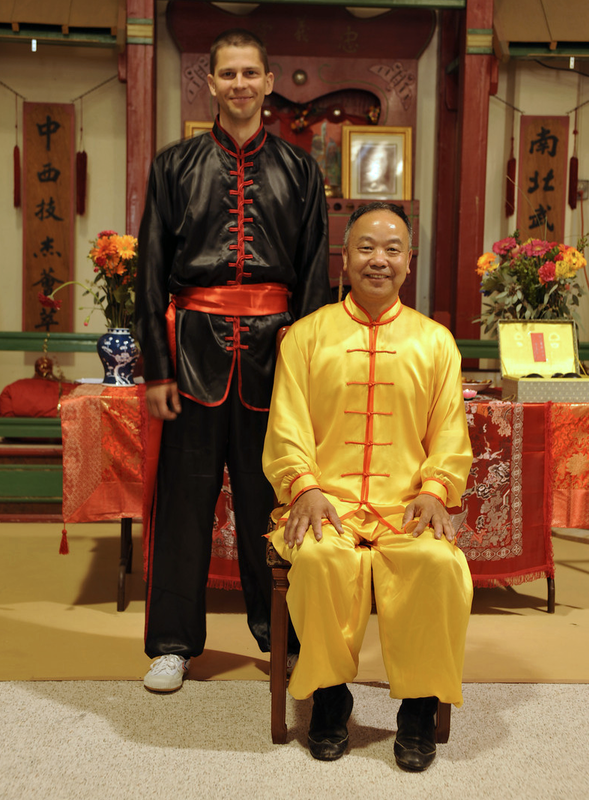 Through his school, through his store, through his videos, through his books, and through his disciples and instructors and through their students in turn, Sifu touched the lives of thousands. I count myself extremely lucky to have – pretty much by accident – found my way to his school eighteen years ago and gotten the chance to know him. He has been a major part of my entire adult life. I will cherish all the lessons he taught me, both in the martial arts and in how to be a great human being. I will strive to honour those lessons and his memory, practicing with equal passion and sharing that passion with equal generosity. I will carry on his legacy, in whatever ways I can. Grandmaster Wing Lam passed away this morning. The world has lost a treasure. I will miss him dearly, as will we all. Thank you Sifu, for everything. Thank you very much for your kind words. I’m sad, but also feel very lucky to have known him and proud to be his disciple. He will forever be an example to me of living a life full of exploration, wit, and of making a difference.